Swamplandia! 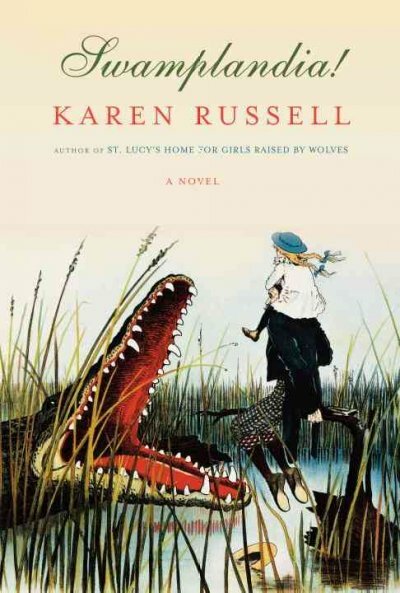 (Vintage Contemporaries) by Karen Russell is a very good book. It's kind of sad though. It's pretty bizarre. It's about a quirky family that runs Swamplandia, a decrepit alligator theme park. I guess it's the coming-of-age story of the little girl who narrates. It's really great writing but I sort of hate what happens in the story. Have you read it? I don't want to give away the ending if you haven't read it. I don't know. It's kind of disturbing, partly because it's written so well. I don't think this book report is helping you very much. I really liked reading it for a book club where I could process and discuss. I'm not sure this is a good one to read just for "pleasure." I was going along following the little girl's perspective and then (SPOILER) I had the most sickening paradigm shift where I realized I'd been taken in by her naivete. It didn't feel good, but it's a feat of writing. Kind of a creepy feat, I suppose. I don't know, man. Read it if you want and tell me what you think. I agree. If that makes sense. It's so cleverly written, but you feel like a bit of a fool at the end. I loved it for its guts and smartness but I can't think of anyone I would recommend it to. I think it's a testament to the author's skills that I was so totally swept in the journey, and then, yes, totally heartbroken when I realized what was really happening. I actually yelled, "NO!" and my husband looked at me like I was nuts. The parallel stories of her brother at the theme park and of her sister and ghost were great too. My husband read this and deemed it too bizarre/offensive for our not-very-edgy book club, so I shall have to read it for pleasure. It awaits on my shelf. I like spoilers, but now I'll be guarded so as not to get taken in. Based off your recommendation I'm reading The Book Thief! I just read The Red Book by Deborah Copaken Kogan and I was wondering if you'd ever want to give it a review. On one hand, the book is tremendously well written- I learned some new vocab and you really get a feel for the characters. On the other hand, kind of as you stated above, "I sort of hate what happens in the story." It's all about death and affairs. I wondered what you would think of it. Thanks for being a blogger who loves reading as much as I do! Yours is the first review of this book I have read, and I have been curious about this book since the first time I heard it mentioned. I think it's interesting that you point out that it seems a little too much like an artificially plumped up short story than a real novel, and that in itself might keep me from reading this one. Thanks for your insightful post.